Heat oven to 450°F. Make pie crust as directed on box for One-Crust Baked Shell using 9-inch tart pan with removable bottom. Bake 8 to 10 minutes or until lightly browned. Meanwhile, in 8-inch skillet, melt butter over medium heat. Add shallots; cook 2 to 4 minutes, stirring occasionally, until tender. Remove from heat. Arrange apple slices in concentric circles in single layer in crust. Spread butter mixture over apples. Bake 15 to 20 minutes. Sprinkle nuts, cranberries, cheese and thyme over apples. Bake about 3 minutes longer or until crust is golden brown. Cool on cooling rack 10 minutes. Serve warm or at room temperature. Garnish with onion. Shallots look like mini onions and taste like a mild mix of garlic and onion. You can usually find them near the onions in the produce section of the supermarket. 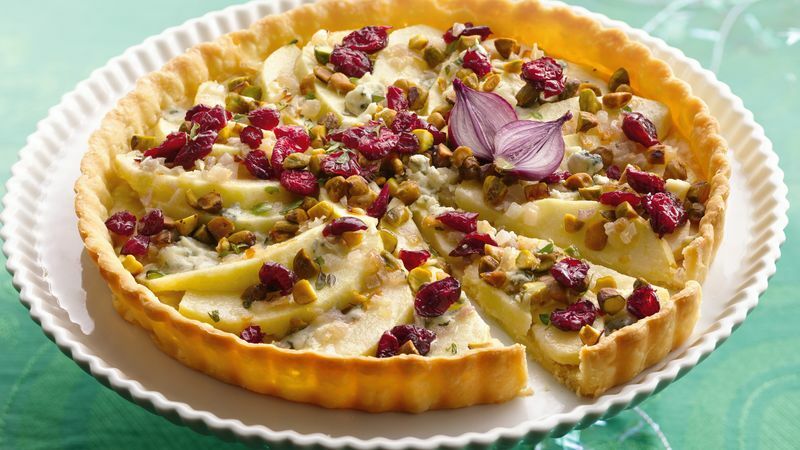 Try making this elegant tart with pears instead of apples.